Osteoarthritis (OA) is a slow progressive disorder of synovial joints. 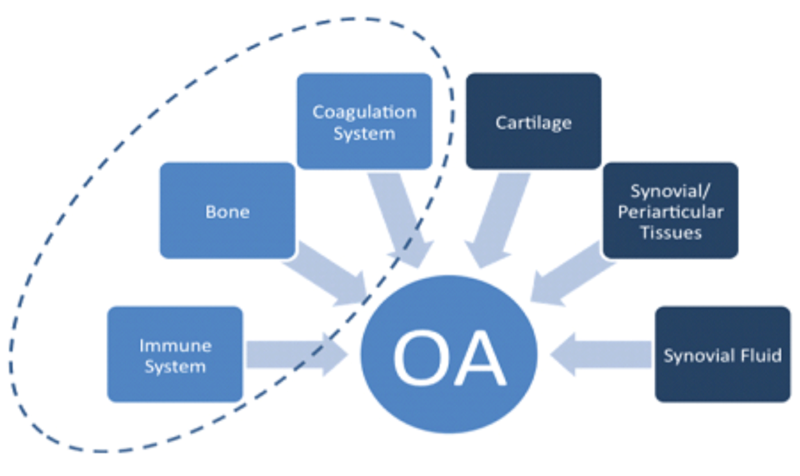 OA specifically involves the imbalance between catabolic and anabolic processes (metabolism) resulting in erosion of joint cartilage, remodelling of subchondral bone, osteophyte formation and variable degrees of synovial membrane inflammation (synovitis). OA is the most common form of arthritis and is present in 20% of dogs over one year of age. OA is also referred to as degenerative joint disease (DJD). These changes in the metabolic balance in the joint lead to the following changes in the pathology of the arthritic joint. • Decreased synovial fluid quality (viscosity) – Due to defective synoviocyte metabolism the major component of synovial fluid, hyaluronan, has reduced molecular weight reducing its lubrication qualities. Additionally there is hypoxia, decreased pH and lactate accumulation in the synovial fluid. • Cartilage failure – Cartilage failure is both a primary cause of OA and a secondary outcome of the arthritic process (get the pdf here). Cartilage failure is characterised by softening, fibrillation, fragmentation and degradation of the cartilage matrix reducing its functional capacity. • Heightened inflammation (synovitis) / Immune response – Cartilage degradation products elicit t an immune response that provokes subsequent inflammation in the synovium, synovitis. The inflammatory response causes a release of noxious substances, which subsequently affect cartilage, bone and synovial fluid. • Vascular engorgement – The immune response can lead to lipid deposition and fibrin clots in synovial tissues and subchondral blood vessels. Subsequently, OA affected patients have hyperlipidemia, hypercoagulability and hypofibrinolysis. 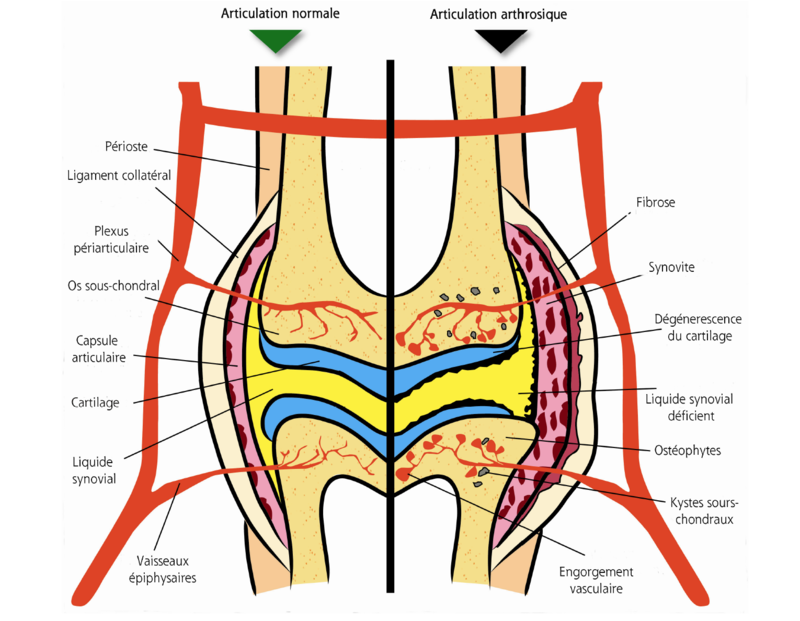 It has been shown that 60-70% of OA patients have hypercoagulability and hypofibrinolysis. • Cell necrosis, bone remodelling, bone necrosis. – Blood flow and nutrition to bone and synovial cells is compromised by lipid and fibrin occlusions resulting in ischaemia, cell necrosis, bone necrosis and joint pain. Below is a comparison of the changes in an osteoarthritic joint next to a normal joint.